The Crowley building is only the second building in Jacksonville to attain the LEED Silver award for commercial interiors. With a total renovation and construction budget of $8.5 million, Crowley's goal was to convert the five-story, 110,000 square-foot office building into an open office environment that would promote environmental sustainability, enhance teamwork and collaboration and reflect the company's brand and culture. The interior design features cubicle work stations for all employees, including senior executives, and fully enclosed conference rooms and private enclaves throughout. 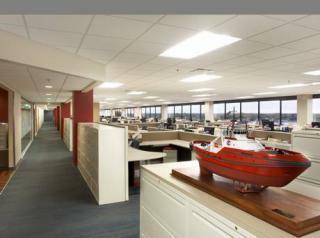 This open environment approach allows natural day lighting and views for the majority of workstations. In order to maintain business operation, construction was handled in five phases, one for each floor. To help with energy conservation, all existing T8 fluorescent light fixtures were replaced with energy efficient T5 fluorescent light fixtures. This single update equates to a 55 percent reduction in lighting energy consumption. Additionally, Crowley achieved a 96 percent waste diversion from the landfill, by recycling materials like metal, glass, cardboard and carpet during demolition phases and by donating almost all the company's used furniture to local schools, charities and businesses. Other LEED components included adding bicycle racks, convenient parking spaces for carpools, low flow water fixtures, Energy Star appliances, low-emitting furnishings, HVAC (Heating, Ventilating and Air Conditioning) upgrades and the utilization of various sustainable materials. Motion activated faucets and waterless urinals were also incorporated to reduce water usage. Combined, these building characteristics reduce operational, maintenance and energy costs.